In the age of advanced communications technology, small and medium manufacturers still resort to conventional, manual means of communicating with their customers and suppliers and not use EDI. Sales invoices, purchase orders, shipping documents, Advanced Shipping Notices (ASNs) are manually created and sent via email to suppliers and customers. This information is in turn manually recorded within their proprietary internal systems increasing the chances of data entry errors, information being misplaced or lost etc. Increases operational, overhead costs, reduces sales and profit margins owing to delay due to delayed or no communication. Technological adoption in the form of EDI. EDI stands for Electronic Data Interchange. It is defined as a structured electronic exchange of business information/data between computer systems existing within an enterprise or between enterprises in a pre-defined, pre-agreed, standardized format. EDI helps enterprises to speedily exchange accurate and reliable data with each other leading to streamlined workflows, faster operational & production lifecycle, increased cashflow and productivity. GS1 EDI, TRADACOMS, ODETTE etc. These standards determine how the business information should be interpreted by EDI systems and communicated between two trading partners. Manufacturers in US mostly follow ANSI ASC X12 standard to communicate with each other. To communicate via EDI, manufacturers usually procure a standalone EDI software or an ERP software. These systems use a series of mapping and translation processes to convert data that the EDI/ERP system can interpret and transfer to the recipient system. Data here refers to actual transactions and not simple text messages. Each transaction consists of data element strings such as item number, item type, quantity, product price, required date etc. When a manufacturer sends a purchase order to a supplier to procure a certain quantity of raw materials, the EDI/ERP system translates the order details into data element strings that the system understands, then proceeds to send it to the supplier through internet or VAN, whose system in turn translates it back to reflect the purchase order details. The entire process is instantaneous thereby reducing the time taken to communicate with each other and conduct transactions. In the world outside of manufacturing, common individuals also use EDI to conduct bank and purchase transactions such as, Electronic Fund Transfers (EFT), electronic purchases, ATM withdrawals etc. What is EDI’s application in Manufacturing? EDI has a wide range of application in manufacturing especially automotive, aerospace, retail and metal fabrication to name a view. Usually, manufacturers of these segments have a large supply chain, and have to constantly communicate with numerous suppliers to procure materials and ship products to customers. Not only this, EDI can be applied throughout the manufacturing workflows such as sales order management, inventory management, supply chain, shop floor operations, customer shipment etc. A customer sends a purchase request to the manufacturer using EDI Purchase Order Code – 850. The purchase order contains item type, item code, quantity to be manufactured etc. The manufacturer’s EDI system receives and interprets this purchase order and converts to a sales order automatically. A customer acknowledgement with the EDI code – 997 is sent to the customer indicating that the order has been received. Post acceptance of the purchase order by the manufacturer, a purchase order acknowledgement with the EDI code – 855 is sent to the customer indicating that their order has been confirmed. Apart from the confirmation, it can also contain details about change in item pricing, item availability, tentative shipping and delivery date etc. Once the item is manufactured and is ready to ship, an Advance Shipping Notice with the EDI code – 856 is sent to the customer alerting them about the shipment. The ASN contains all relevant details such as item type, item code, quantity, shipment tracking number, delivery date, shipment mode etc. Post shipping, the manufacturer sends an Invoice with the EDI code – 810. This replaces the paper invoice and is relayed directly to the customer’s EDI system. The invoice shows up in the customer’s accounts payable, indicating that they have to make the payment to the manufacturer. When the customer makes the payment, they issue a payment order with the EDI code – 820 indicating a payment done against the invoice and closure of the order within the system. This is just a simple example of how an automated EDI system works and shows how without human intervention, the entire process runs automatically by itself. EDI’s advantages increase exponentially when bundled with an ERP software. Most ERP systems today have an inbuilt EDI system that makes it easier for manufacturers to seamlessly communicate and transact with their stakeholders. Apart from swift communication requiring no human intervention, an EDI + ERP integration ensures that updates are automated and instantaneous in areas of inventory, sales, order management, shipping, shop floor operations etc. The manufacturer gets to yield faster order processing, reduced sales lifecycle, real-time supply chain visibility, inventory control, reduced human errors and more operational efficiency. EDI reduces usage of papers to a naught as transactions are conducted electronically, is much more efficient and quicker. Also, it is environment friendly as carbon footprints are reduced due to less usage of papers. 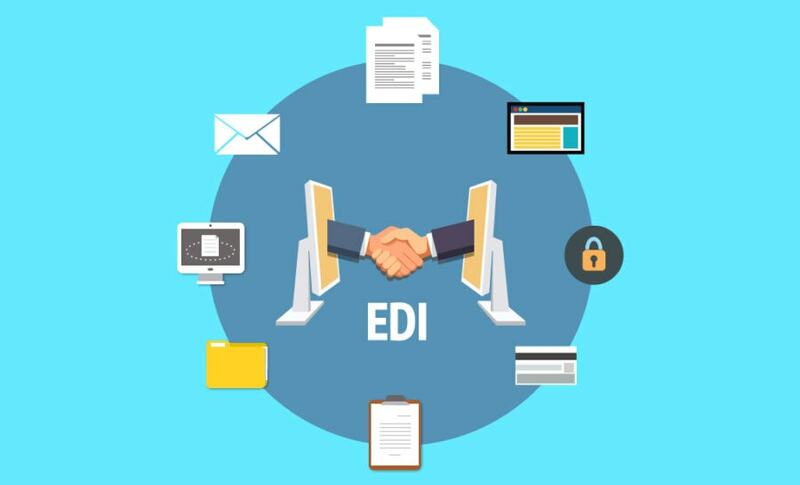 Overall, EDI reduces overhead costs that go into procuring tons of paper, printing them into various forms, storing and filing them, posting them to stakeholders. Also, drastically reducing the human efforts and costs that go into maintaining them. In manufacturing, speed of operations and delivery determine success and growth. EDI coupled with an ERP speeds up manufacturing lifecycle by over 60% as it automates business processes and transactions which otherwise would have required manual, human intervention. EDI eliminates manual keying of information both at the customer and manufacturer’s end at every transaction stage. These transactions are now done completely in electronic format, thereby reducing typo errors, mis-information due to bad handwriting, missing documents etc. EDI transactions are secure as the entire system is protected by high security compliance standards and communications protocols. Apart from enterprises, financial institutions and banks use EDI on a large scale owing to high security. EDI has powerful capabilities specially when coupled with an ERP software. Manufacturers utilizing EDI to transact and communicate with their stakeholders run their business with a lot more efficiency. Their transactions are faster, operation lifecycle is less, and they are able to deliver better than their peers. In short, EDI becomes a growth driver for them. ← How does ERP streamline Sales Management for Manufacturers?